We are a leading Manufacturer of batching controller systems from Pune, India. Being a noteworthy organization in this business, we are engaged in offering Batching Control Systems. We give multi formula and multi-part grouping frameworks with any number of formulas and segments. We select the PLC or controller as per the multifaceted nature. Our clump control frameworks can be controlled effectively and handle serenely. 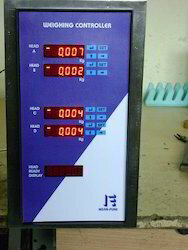 Our Batch Control Systems can be self-loader, completely programmed and manual; as per the prerequisite of the clients.